The use of coconut in Thai cuisine can be described as diverse and endless. 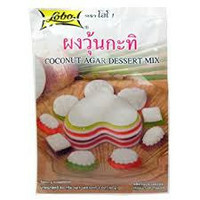 Here is one example of the Thai dessert category. Non-dairy creamer (Glucose, Hydrogenated Palm Kernel Oil and Casein from milk 45%, Coconut Milk Powder 25%, Sugar 20%, Salt 4.69, gelling agent E406, Agar 4.6%, Anti Caking Agents E341, Tricalcium Phosphate and E551, Silicon Dioxide. Contains Milk all allergens in Bold.